Carousel Horse cross stitch cards are ideal for a little girl's (or a young at heart's) birthday party. Pretty and sparkly horses prance around while being framed by roses. Cross stitch them together as a sampler or bell pull or stitch them individually for a stash of cards and ornaments. Each design measures 50w by 50 high and contains Kreinik and DMC threads. 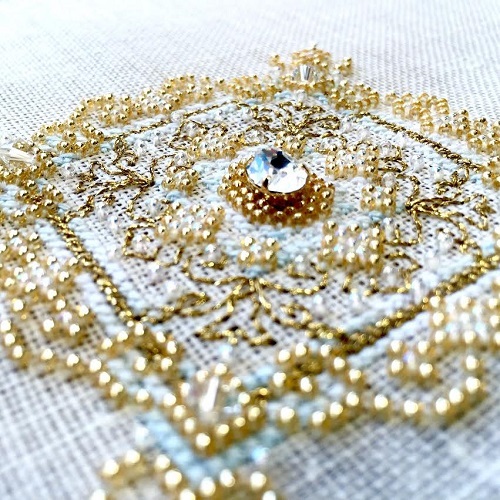 You can replace the Kreinik French knots with a gold bead colour instead for some added dimension. You will receive an easy to read black white symbol chart with coloured French knots and coloured back stitching lines.